I’ve never lived in or anywhere near Berkeley Square in London so until I moved here I’d never heard the sweet song of the nightingale. Our seasons are defined by the sights, sounds and smells of what goes on around us. Canigou with her melting snow, the blackbird belting out his tune, the redness of the poppies, the yellowness of the broom – I went away for a week and when I came back I was amazed to see the lush greenness of everything. Pablo’s Bar in the Place Pablo Picasso. Come and join us for coffee and browse through the books. At the Café des Artistes there’s always a good turn-over of paperbacks, English and French. Also CDs and DVDs. You can buy a coffee and take two books. On Wednesday 4 April we held our Open Meeting at the hotel Mas des Arcades in Perpignan. Penny Parkinson opened the morning by giving everyone an update on CSF matters. Our speaker was Dr Rita Jordan, Emeritus Professor in Autism Studies at the University of Birmingham, who talked about ‘The coming era of patient-centred medicine’. She explained the different variants of autism and then went on to speak about individual analysis. She made the point that with both autism and cancer, treatment should be personalised and each patient treated as an individual case. The meeting was followed by an excellent lunch. Hazel Turner has sent out the latest edition of Touchlines which as you know is Cancer Support France’s Newsletter. When you have a moment, do have a look. As well as some interesting articles, there is news of CSF events throughout France. CSF have a couple of tables at this large all-day Vide Grenier which is held every year in St Cyprien and is very well-attended. We’ll have books and DVDs of course. We also need other things we can sell. If you have anything which is in good condition, please bring it along on the day. (Let me know if you can’t be there and I will try and organise a collection from you.) All will be very gratefully received. 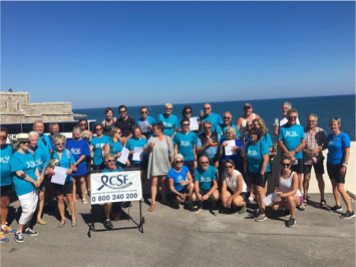 After a hugely enjoyable Cycle For Life in 2017, 2018 sees the biggest challenge yet – a 650km ride from the Atlantic seaside resort of Royan to the sunny beaches of the Mediterranean at Marseillan Plage over a period of two weeks. Penny Parkinson will be cycling the 21km on the last day! She has sent out an email giving FULL DETAILS OF THIS Cycle for Life EVENT. (See below) Please do have a look at it. It is not a race and everyone can do as few or as many days as they like, taking it at their own pace. It is all low-level, following the canals and using cycle routes where possible, and is suitable for novice cyclists and families. There are two planned rest days in beautiful Bordeaux (22nd May) and medieval Carcassonne (29th May). The arrangements for this year’s event are going well with a couple of great walks in mind. The shorter walk, about 5kms, will be a gentle walk through our lovely countryside, with the longer walk, about 9-10kms, making an interesting challenge for others. There’ll be activities, including pètanque, for everyone during the morning so bring friends or family and pack a picnic or some sausages for a BBQ. There will be more details later but in the meantime if you would like to join in, whether as a walker or helping with the bar, cake sale, BBQ etc, please send an email to Lynn (lynnrhall66@gmail.com) who will keep you informed. On Saturday 13 October we will once again be holding our Annual Autumn Ball in Bages. This is always a very relaxed evening, sitting with friends, joining in the fun and winning some prizes. There’s live music & dancing, an auction & a tombola stall, a tapas style meal with wine and a bar selling beer and soft drinks. Make a note in your diary and watch this space for more details. This year the CSF Cycle for Life, starting in Royan on the 19th May and ending in Agde on the 31st, will come through our CSF Sud area between the 26th and the 30th May. We are looking for your help in a variety of ways, if you can become involved, do contact me. Cyclists – The Cycle for Life is not a race, it is a fun event for people of all ages and experience and no-one is expected to cycle the whole route. You can join in for a day or multiple days and some people have indeed already signed up for the entire ride. If that does not appeal to you then please do consider saddling up for a day or two as the ride comes through the Sud area. Registration – We need volunteers to check cyclists in when they arrive at the destination for the day (4 to 5pm) and also when they leave in the morning (9 – 10am). For us, that means ‘in’ to Castelnaudry on the 26th, ‘out’ of Castelnaudry on the 27th and ‘in’ to Carcassonne the same day. ‘Out’ of Carcassonne on the 29th and ‘in’ to Le Somail. And finally ‘out’ of Le Somail on the 30th. Support vehicles – We are lucky enough this year to have two support vehicles starting with the group from Royan. However, we usually don’t know until very close to the start date, how many people will be looking for transport of luggage or transport to and from their hotel/campsite/B&B. Join us for Fish and Chips in Carcassonne – The cyclists are having a rest day on the 28th. Chris and Claire of C&C Fish and Chips have arranged a fish and chip supper (with peas) at a rate of €9 for cyclists and €10 for others. This will be held at La Métairie, a lovely café in sight of the old Cité with a super terrace and heated conservatory. Have a look for further information and the address HERE. Or lunch at Homps – Chili and Spice who did a great lunch last year, have offered to do the same again, this time near Homps. A venue is yet to be finalised and a two course meal will be €15 which includes a donation to CSF. General support – And do take the chance to support the cyclists along the route either at the start and end points (final details will be posted to the website nearer the time) or along the canals. The aim is to raise awareness, as well as funds for CSF National specifically to support the Trainers’ Conference and two Train the Trainer days. These are already booked for November 2018 and will, of course, benefit all the CSF associations as our training is the cornerstone of the work done by our active listeners. Very many thanks to you all for your continued support, I hope you have had an enjoyable Easter and are ready to spring into Spring.